Pharmaceutical companies are some of the most volatile stocks making them ideal for day trading due to the large trading ranges that allows for day traders to make profits off the volatility. The reason why pharmaceutical stocks are volatile is because these stocks face a great deal of risk in terms of the research and development that goes into a drug, with no guarantees that the final product will be approved. A lot of time, money and resources are poured into the development of new drugs, including trials and finally the testing and approval process, making the pharmaceutical drugs understandably volatile. Due to the nature of the business, pharmaceutical and biotechnology companies are often under the scrutiny of regulators and the government and prone to regular checks and fines that is common to the industry. All of these factors play into making pharmaceutical stocks volatile as a result. For a day trader, a volatile stock is one of the basic requirements to make money on a daily basis trading stocks. If a stock price doesn't move much during the day's trading session, it becomes difficult for day traders to make any profits. Besides volatile, the stock also needs to have significant volume so the stock can absorb sudden shocks while maintaining a reasonable spread as well. There are many different stocks from the different sectors that one can look at but pharmaceutical stocks or bio-technology stocks, its nearest sector, is one of the most ideal stocks to choose for day trading and can compliment other stocks such as the internet or social media stocks which are also volatile and allows for traders to comfortably day trade these stocks. Besides volatility, good risk management is also essential, which are the two most important things needed for a day trader to be successful. Of course, having a low cost broker for day trading the stocks is also ideal so as to keep the trading expenses low. To trade pharmaceutical stocks, one can start with ETF’s which can track a couple of stocks from the sector or to look at individual stocks as well. Armed with the above information, the first place to start with is a stock screener to look for individual stocks. The other alternative is to look for ETF’s. The table below shows the top four ETF’s which tack the pharmaceutical companies. Although some of the ETF’s have a beta of less than one, you can find individual stocks within the ETF that have a beta that is higher than 1. 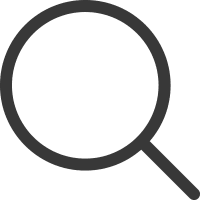 To track individual stocks, there are many tools and online stock screeners that allow you to scan for stocks for free. The paid versions often give you additional control in the way you want to set the filters as well as getting automated emails. 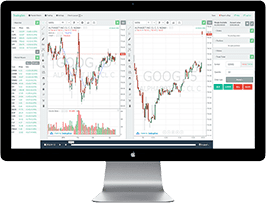 Finviz.com is one of the most well known stock scanners and in the context of this article; Finviz free stock scanner allows you to filter stocks that are suited for day trading. The first step is to select the sector to Healthcare with the country set to the U.S. The market cap is selected to +mid cap which is healthcare stocks with a market capitalization of $2 billion and more. We also focus on volume and filter stocks to show volume of 200k or more in order to weed out low interest stocks. In the 'Technical' tab the Beta is selected to "Over 1.5"
Beta in stocks is a measure of a security's risk, relative to the market index. A security with a beta of 1.5 means that there is tendency for the security to move 1.5 times more than the market returns. Beta simply measures volatility and not the direction. Once the screener is run, you then get a list of the filtered list of pharma stocks based on the criteria mentioned. You can of course change some or all of the parameters above to change the type of stocks you want to see. 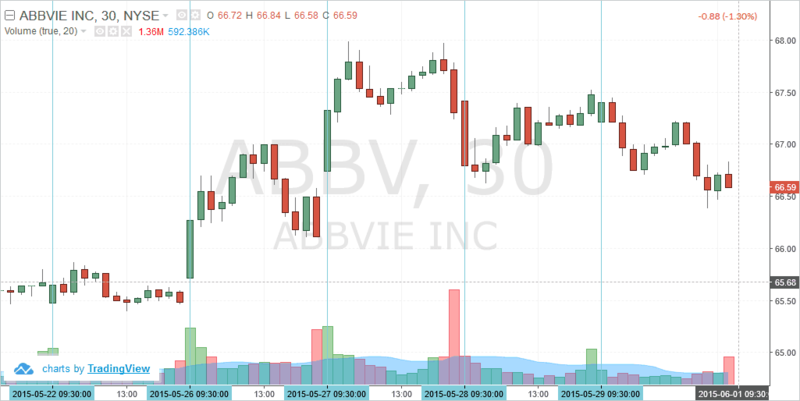 The above chart shows some well known names such as AbbVie Inc., Celgene Corporation. From here on, it is up to the trader to decide on what stocks to trade. It is always best to look at the basic fundamentals governing the stock price before looking at the technicals. Once the list is generated, the next step is to keep a look out for any potential news releases. These unannounced news releases often tend to drive up volatility in the pharma stocks and for the short term day trader, this can be a great opportunity to make significant profits in a short amount of time. 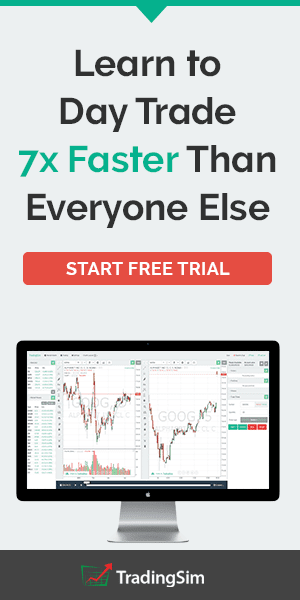 Day traders should also watch out for any pending verdicts in regards to a drug trial’s results or some pending patents, all of which can significantly increase the volatility in the stocks and can catch an unprepared trader on the wrong side of the market. Pharma stocks can sell of over 5% on average when the news is bad. Thus it is always best to keep an eye out on the fundamentals before trading. Below is the intra-day chart for AbbVie Inc. (ABBV) based off the 30-minute time frame and the price action for the intraday chart shows how day traders can make decent profits by trading the pharmaceutical stocks in the short term. While the above mentioned methods will see some stocks fall in and out of the scanner, there are some nearly ever-green pharmaceutical stocks that day traders can simply start trading without thinking much. Below are some top five pharma stocks that are ideal for day trading, but of course, it is always advisable to first do some homework on the stocks before day trading them. Johnson & Johnson (NYSE: JNJ) is one of the leading name in pharmaceutical, health care sectors. Boasting of market capitalization of over $310 billion, Johnson & Johnson is listed on the Dow Jones 30 and the S&P500. The company has a diversified product range including packaged goods and household products. Johnson and Johnson was established 1886 and is a household name with product brands such as Band-Aid, Johnson's baby products, Acuvue contact lenses among other products. The company also develops medical instruments alongside developing drugs. 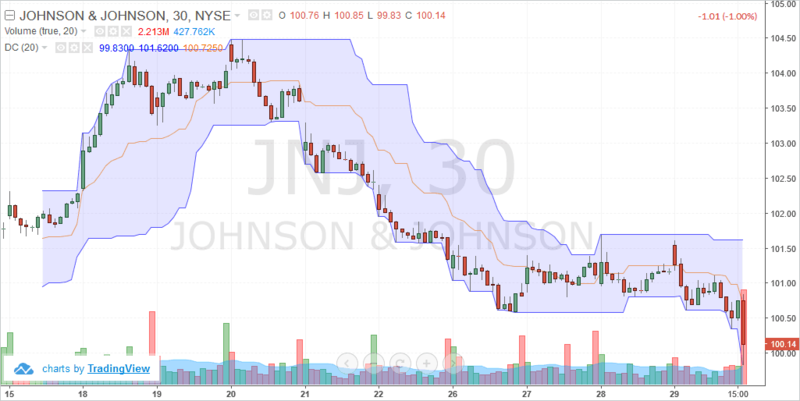 Johnson & Johnson is a fairly stable pharmaceutical stock, but the level of volatility might vary due to the fact that the company is well capitalized and is categorized into a large cap+ sector, thus the potential for the upside is fairly limited. Long term investors prefer Johnson&Johnson stocks because it pays dividends and is often fund as part of the a fixed income portfolio in stocks. 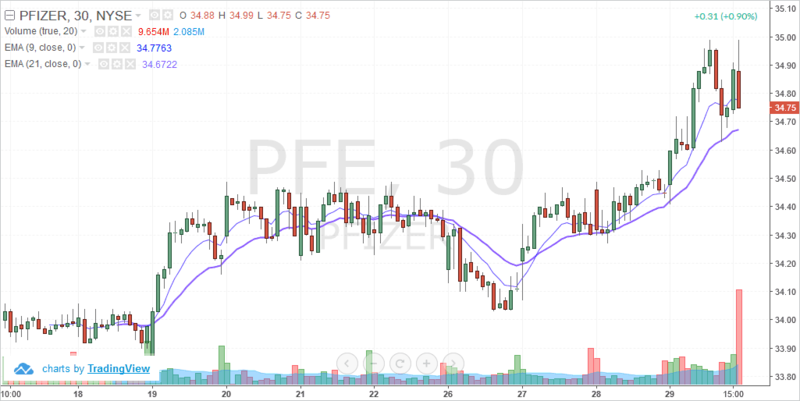 Pfizer Inc. (PFE) is one of the oldest pharmaceutical companies in the world and probably well recognized for its products. Pfizer Inc. was established in 1849 and boasts of a market capitalization of $196 billion. Some of the well known drugs from Pfizer Inc. are Viagra, Lipitor, Celebra to name a few. Pfizer Inc. is a component on the Dow Jones Industrial Average 30 and the S&P500 stock index. Pfizer Inc. is one of the stable pharmaceutical stocks to trade but due to its global presence the stock price can often come under pressure by some ruling or tighter regulation in a foreign country that can hurt sales. Pfizer Inc. is relatively stable having a beta of 0.96 and putting it in the same league as that of Johnson&Johnson (JNJ). Merck & Co. Inc. or Merck Sharp & Dohme as it is known abroad is an American pharmaceutical company. It was established in 1891 in New York and boasts of a market capitalization of $177.53 billion, making it a component on both the Dow Jones 30 and the S&P500 stock indexes. Merck & Co. has a beta of 0.81 but has an ATR of 1.05, making it a pharmaceutical day trading stock worth the trader's interest. Although the drugs from Merck might not be as famous as that of Pfizer's some of the strong names in the market include Gardasil, Keytruda. 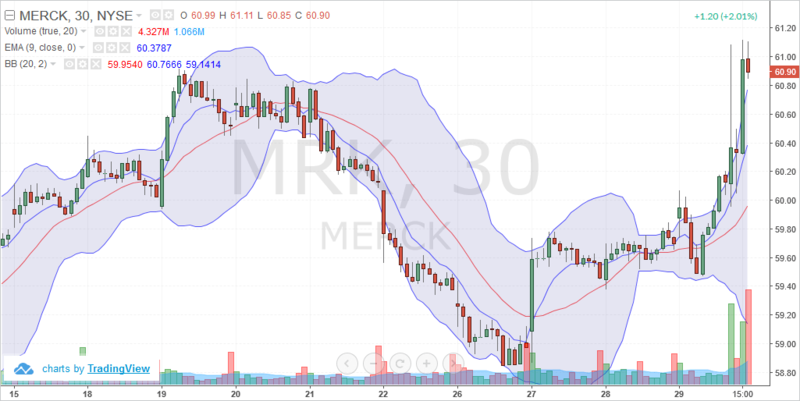 Merck & Co. also joins the ranks of the Johnson & Johnson and Pfizer Inc. as a stable and well capitalized pharmaceutical company that is also fairly suited for day trading. Amgen Inc. is a biopharmaceutical company based in California and was established in 1980. Amgen Inc. is a fully independent biotech firm and has some products in its name. The company has a market capitalization of 124.58 billion and is listed in the S&P500 index and the Nasdaq 100. 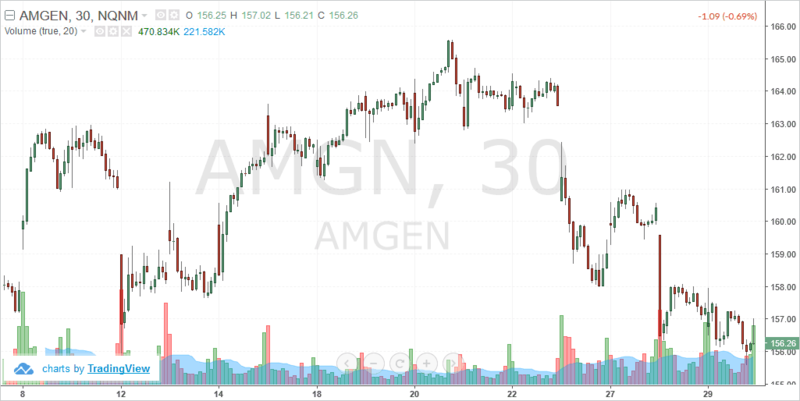 In terms of volatility, Amgen stocks have a beta of 1.19 with the ATR value of 3.03, making Amgen stocks very suited for day trading. But the high beta also makes the stocks a bit more risky to trade due to the volatility. Amgen's flagship products are Neulasta/Neupogen which are drugs commonly used to support cancer patients undergoing chemotherapy. 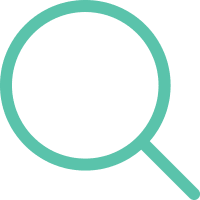 The company is often involved in research and development and thus investors are always on the lookout for new drug research, trial stages and of course FDA approvals. Amgen Inc. also has a decent history of seeking out other biotechnology companies for acquisitions. Between 2012 and 2013, the company came under severe scrutiny for pursuing illegal marketing practices as well pleading guilty to some criminal charges. AbbVie is a biotechnology and a pharmaceutical company and was a spin off from Abbott Laboratories. Abbvie Inc. is listed on the S&P500 index and was founded in 2013 and operates as a research based pharmaceutical company. The company has a market capitalization of 98.87 billion and has a high beta of 1.58 with an ATR of 0.98. Biotechnology or pharmaceutical stocks form a major part of the Nasdaq exchange and some stocks are listed on the NYSE exchange with some being part of the Nasdaq 100, S&P500 and the Dow Jones 30 indexes. Pharmaceutical stocks are typically volatile and are often considered to be growth stocks and show large potential making them a favorite among all types of traders and investors. The intraday volatility of such stocks makes it one of the most widely sought after stock sectors for day traders. However, one should apply caution as at times the high level of volatility can also bring about sharp losses, which is something to bear in mind and characteristic of such type of stocks. Pharmaceutical stocks are well suited for technical trading and thus attract not only day traders but also swing traders as well. Long term investors often make use of fundamental analysis and invest in biotechnology or pharmaceutical stocks for the long term, which are more risk prone but the returns are also often big. You can often find lots of mergers and acquisitions in this industry but the main market moving events are the Federal Drug Administration (FDA) approvals of the drugs and patents for the drugs which tend to give a boost to the respective stocks. Mergers and acquisitions (M&A’s) are also nothing new to this sector and is one of the other factors to bear in mind, even for day traders. Last but not the least, pharmaceutical companies often come under the radar of lawmakers, not just in the U.S. but also abroad where the company has subsidiaries or branches, all of this combined feeds into making the stock prices of pharmaceutical companies quite volatile and good hunting grounds for day traders to profit.